This house at 180 Abrams Mountain Road, called "The Froggery," sold at auction over the weekend for an undisclosed sum. Earlier this year, it was listed for $10.9 million, making it the most expensive house on the market in Maine. 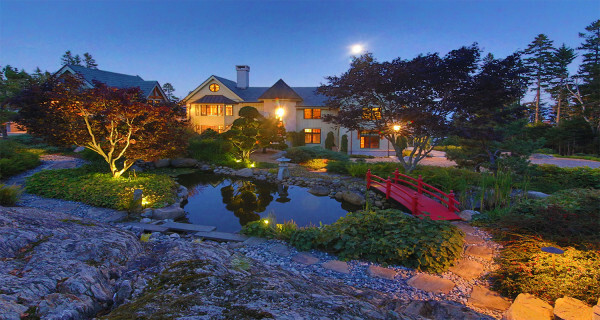 ISLESBORO, Maine — The island mansion identified by Forbes magazine this spring as the most expensive house listed for sale in Maine changed hands at auction over the weekend. The 8,000 square-foot home on 15 acres of land near Hewes Point was listed for $10.9 million — including two Steinway pianos and other furnishings. The DeCaro Luxury Auctions company that sold it Saturday, however, did not disclose the sale price or the name of the buyer. It was sold with no reserve, meaning that it was sold to the highest bidder with no minimum bid set. Islesboro, located in Waldo County and home to about 600 people year-round, has made its way onto the Forbes magazine list of most expensive houses for sale for two years in a row. Last year, it was the Grace Estate on the island’s Keller Point that, according to Business Insider, was considered “a steal” at only $9.5 million. The lavish 17-room mansion, built in 1918 for the daughter of the late New York City mayor and businessman William Russell Grace, includes eight bedrooms, a library, a billiards room, two laundry rooms, a pool, gardens and even a putting green. BDN writer Bill Trotter contributed to this report.